Dark Matter is 26% of the Universe that was present in the earliest moments after the Big Bang and exists around us today. It is clear evidence of new physics, but as yet has eluded direct measurement. I build theoretical models of dark matter, as well as work to connect the results of different classes of dark matter experiments (direct, indirect, collider) with theoretical advances and the results of simulation, in order to use the available experimental tools most effectively in the search for dark matter. Most of the Universe passes right through you. Everything you can touch, smell, taste or see is composed of the same sort of atoms as the hundreds of billions of stars that make up the Milky Way Galaxy in which we live. The same sort of atoms make up the stars and dust and gas that compose the hundreds of billions of other galaxies in our visible Universe, as well as the gas that lies in the intergalactic depths, far from any star. But all those atoms are but a small part of the stuff that makes up the Universe. If you added up all the matter and all the energy in the Universe, the stuff that makes up you, me, the Earth and every star, planet, or grain of dust in the 40 billion light-year radius of Everything That We Can See would be less than 5% of the total. Most of the Universe is something quite unlike us. In fact, we now know that there are two such things that are not like normal matter (often called baryonic matter). We call these two substances Dark Matter and Dark Energy. And we know very little about either, other than they exist, and they have gravitational effects on how the visible matter in the Universe evolves over time. These gravitational effects are, of course, how we found out that both of these things exist. Despite the similarity in names, dark matter and dark energy are not thought to be fundamentally similar things. Dark Energy appears to be something that has the unusual and counterintuitive property that it pushes out on the fabric of space-time, making the expansion of the Universe (caused by the Big Bang) speed up over time, rather than slow down. At this point in time, we do not know if dark energy is a particle, a field, some intrinsic property of space-time, or something else. Its effects are seen only on the largest distances, further even than the distance from the Milky Way to our nearest big neighbor, the Andromeda Galaxy (about 2 million light-years distant). Our best current measurements indicate that dark energy is about 68% of the energy budget of the Universe. Dark Matter (about 26% of the Universe), on the other hand, is in some ways more familiar than dark energy. Like the atoms and protons and electrons that make up normal matter, dark matter is... matter, as far as we can tell. It interacts with gravity like we do: it pulls rather than pushing like dark energy. Our measurements are consistent with dark matter being particles, just some type of particle we have not encountered before. Indeed, no particle in our Standard Model has the right properties to be dark matter. That last fact is tremendously exciting, if you are like me, and someone who is interested in theories of physics Beyond The Standard Model. Dark matter is, as far as we can tell, right here around you and me right now. As we live deep inside a galaxy, we are in a halo of dark matter. In the volume of a coffee cup, on average near the Earth there is about 30 hydrogen-atoms worth of dark matter. Said dark matter is moving through you all the time, at speeds of 200 km/s or more (that is, Mach 590 or higher). The major difference between dark matter and normal matter is that dark matter is dark. It doesn't interact with photons of light, it doesn't interact with the electromagnetic fields which are responsible for making normal matter seem "solid" to us, and it doesn't interact with the strong nuclear force which binds our atomic nuclei together. So the immense wind of dark matter passes through you without leaving any trace. So how do we know it is there? We see dark matter through its gravitational imprint. The most obvious being the galaxies themselves. 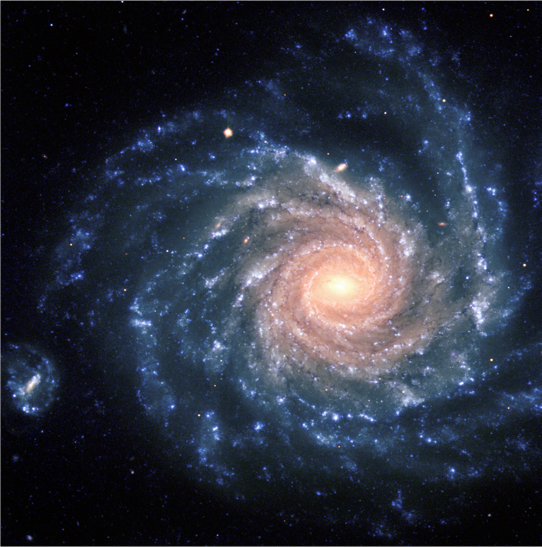 The Milky Way is a spiral galaxy, a pinwheel of 200,000,000 stars, one of hundreds of billions of similar pinwheels across the cosmos. Looking at such spirals, you might think they are spinning. Well, they are. The Sun (dragging the Earth along with it) orbits the center of the Milky Way once every Galactic Year, which is about 200 million Earth years (making the Earth about 25 in Galactic Years). Like any object on a curved arc, the Sun and the rest of the stars orbiting a spiral galaxy must be kept on that arc by some force. Think of taking a turn at high speed in a car, you get thrown against the wall of the car on the outer edge of the curve; that wall supplies the inward force to keep you moving on an arc, rather than the straight line you'd naturally move in (the friction between the wheels and the ground is what keeps the car and the car wall moving on the arc. Don't take turns at high speeds on wet pavement). So what keeps the Sun moving around the Galactic Center, rather than just zipping off in a straight line for the depths of intergalactic darkness? Gravity, just as gravity holds the Earth moving around the Sun, or the Moon around the Earth. The gravity in this case is the combined gravitational force of all the mass closer to the center of the Galaxy than the Sun is, all the stars, all the gas, all the dust (this includes, by the way, the supermassive black hole at the Galactic Center. However, while this black hole weighs several million solar masses, it is dwarfed by the many billions of solar masses of star-stuff in the Galaxy). Of course, every other star is held in by the force of all the other stars, making up the gravitationally bound object we call the Milky Way. So, if you look at a galaxy and measure the speed at which the stars are moving, you can weigh the galaxy. More to the point, you can weigh the galaxy inside the distance from the star to the center (this fact has to do with the fact that galaxies have a nice symmetry). So, in the 1970's Vera Rubin looked at spiral galaxies (not our own, since it is hard to see our own galaxy clearly, what with us living inside of it an all), and measured the rotation curve, the speed of stars as a function of their distance from the center, then compared with the expected rotation curve, using the visible stars and gas to estimate the mass of the galaxy. The solution is dark matter: something else adding to the gravitational mass of a galaxy, and serving as the glue that holds the stars together. This discovery of Rubin's matched well with previous results from Fritz Zwicky, who had found in the 1930's that larger objects, collections of galaxies called galaxy clusters, were also moving too fast to be gravitationally bound by the visible stars and gas. He had coined the term "dark matter" to explain his results, but the idea had not really caught on. Of course, from these results dark matter could just be that: dark. matter. Regular stuff that just doesn't glow, and so wasn't part of the mass that Rubin or Zwicky could add up in order to get an estimate of the mass of a galaxy to compare with their rotation curves. If, for example, there were trillions of Jupiter-mass planets floating freely through the Galaxy, far from a star, they would be dark, cold, invisible contributions to the rotation curve. Just the thing to be dark matter. To know that dark matter was something fundamentally new required several additional measurements. First, we could look directly for cold Jupiter-like objects (formally called MACHOs: Massive Compact Halo Objects) by observing millions of stars and waiting for a MACHO to drift between us and that star. If that happens, the gravity of the MACHO would pull the star-light in towards it a bit, causing it to blink slightly brighter: an effect called "gravitational lensing." We looked, and we didn't see enough lensing events for there to be sufficiently numbers of MACHOs out there. So that's not it. Whatever dark matter is, it isn't made up of large non-radiating astronomical objects like brown dwarfs or planets drifting in deep space. The real hard evidence that dark matter is something truly new and unique comes from the ashes of the Big Bang. The Cosmic Microwave Background (CMB) is the remnant radiation left over from the early Universe, when everything was hot and dense and close together. About 100,000 years after the Big Bang, the average energy of particles in the Universe was so high that electrons couldn't remain bound to atomic nuclei. This meant that light couldn't propagate. Photons would be emitted by the hot electrons and protons, but only move a small distance before hitting another particle and being absorbed. But as the Universe expanded it cooled (this expansion/cooling relation is the same one that your refrigerator uses to get cold), and eventually it cooled enough to let electrons fall into bound states with protons. Atoms finally could exist. When that happened, every photon that had been emitted, and shortly before would have been absorbed again, well, those photons just kept on going. They've been going on, and on, and on, cooling as the Universe expands, for 13.7 billion years. And if you build a radio telescope, and point it literally anywhere in the sky, you'll "see" those photons, now cooled down to microwave energies. Using the Planck satellite (and before that WMAP and Cobe), we can now measure that CMB very precisely. The Planck CMB map is shown here; it's a projection of what you'd see in the unfolded sky, like a map of the Earth which was oval rather than rectangular. The orange and blue spots are spots that are slightly hotter and cooler than the average. By slightly, I mean 1 part in 100,000 times hotter or colder. The CMB is very, very "smooth." But those tiny fluctuations tells us something very very important. By eye, you should be able to pick out an average spot-size, a characteristic size of a random blue or orange fluctuation. What causes those? Those spots are the location of a spot in the Universe, 13.7 billion years ago, where the collection of photons and electrons and protons was just very slightly hotter or colder than average. That happened because that spot was slight denser or slightly less dense than average. If it was more dense, particles hit each other more often, which means it was hotter. If it was less dense, then it was slightly colder. At the moment when the Universe cooled enough for the photons to fly off (decoupling), that random hot or cold spot got "baked in" to the CMB, and we see it now, all this time later. Now, if you heat of a box of gas, or a box of photons, electrons, and protons, it expands. This is why hot air rises. So if all there was in the Universe was normal matter, the matter in those hot spots would push out, cooling the spot. Gravity would try to pull the overdense matter in. The balance of these two forces would give a characteristic size of hot and cold fluctuations on the sky, and we could predict how many we'd see at different sizes. Now, imagine that a lot of your matter in the early Universe didn't "see" photons. It was, let's say, dark. Then that would change the balance between gravitational attraction, which dark matter contributes to, and the photon repulsion, which dark matter wouldn't see. That would change the pattern of hot and cold spots. Using the incredibly detailed measurements of Planck gives us dark matter as 26% of the energy density of the Universe, and tells us that this dark matter cannot interact with photons the way that the known particles of the Standard Model do. Whatever dark matter is, it is something new. There is actually a lot of other evidence for the gravitational impact dark matter, including detailed studies of how the elements formed in the first 20 minutes after the Big Bang, for example. But I'll leave with one of the most recent pieces: direct images of dark matter. Or at least, direct images of the light bent by the gravitational pull of dark matter, gravitational lensing again. Unlike the lensing from MACHOs, this is lensing on huge scales, the gravity of dark matter in a cluster of galaxies. Below is an image of the Bullet Cluster. Two galaxy clusters collided recently, as in the last few million years. A cluster is made of galaxies (made of stars), gas, and dark matter. When the two clusters hit, the gas in one cluster hit the gas in the other cluster; the cross section for interaction was large, and so particles smacked into each other and basically stopped dead, forming the "bullet" as gas compressed due to ram pressure. The gas is hot enough to emit X-rays, which is how we map its location from Earth. On the scale of clusters of galaxies, individual galaxies are tiny. So small in fact that when you throw two clusters of them at each other, they all miss each other. They passed through, and are visible on each side of the collision of gas. Then, astronomers looked at the light from galaxies behind the Bullet Cluster, and looked for tiny deviations indicating that the light is being bent by matter in between the light source and us. The result map of the matter distribution is the blue in the image below. It is located where the galaxies are, but the required mass for the lensing is much larger than the stars in the galaxies; again, we need dark matter. Interestingly, this sort of cluster collision tells us that whatever dark matter is, not only does it not interact with normal matter very much, it doesn't interact with itself very much. If it did, the dark matter in each cluster would have stopped during the collision, just like the gas.